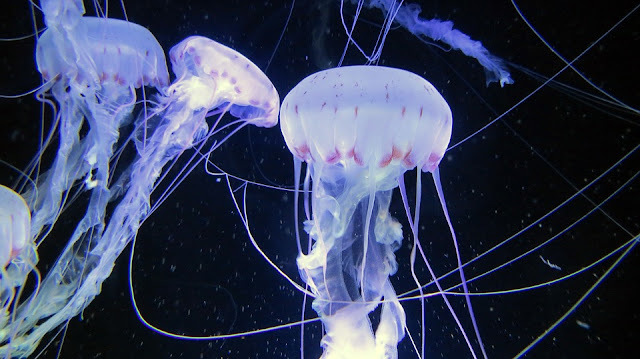 -- Jellyfish presents these aquarium favorites in all their extraordinary and captivating beauty. Fifty unique species, from stalked jellyfish to black sea nettles, are presented in stunning color photographs along with the most current scientific information on their anatomy, history, distribution, position in the water, and environmental status. Foremost jellyfish expert Lisa-ann Gershwin provides an insightful look at the natural history and biology of each of these spellbinding creatures while offering a timely take on their place in the rapidly changing and deteriorating condition of the oceans. Readers will learn about immortal jellyfish who live and die and live again as well as those who camouflage themselves amid seagrasses and shells, hiding in plain sight. • Decorative Aquarium Ornament -- Decorate your aquarium with this mesmerizing lifelike artificial jellyfish. This is a set of incredibly detailed imitation floating and glowing (triggered by environment lights) jellyfish. They will dance with just the slightest movement of water. Made of inert Soft silicone, harmless to all aquatic creatures for both fresh and salt water. • Bubbles The Jellyfish Light-Up Musical Stuffed Animal -- Plays a 4-minute soothing ocean wonder melody to gently calm your baby or lull them to sleep. The plush jellyfish glows in soft illuminating colors of the rainbow. Your little one will be enthralled, watching the changing colors. Features a hangtag for crib mobiles or can be hung in a child's room. - recognizes the importance of stay at home wives and moms. Also referred to as Retro Housewife Day. These wonderful, caring creatures, build and enrich strong family environments. They help to instill family values and good character. - to honor and enjoy sandwiches! Let this month be the month you try a new type of sandwich you've never had before. You just may find a new favorite. Or.... why not have some fun and invent a new sandwich yourself and share it with your family. - Use clichés as much as possible today. Hey, why not? Give it a shot! Win some, lose some. You'll never know until you try it. - A string of local educational TV channels united on this day in 1969, under the Public Broadcasting System banner. Today there are more than 350 PBS stations. - For some folks, a dollar may truly be more than they can give. That's OK! Because it's the intention and the love of giving unconditionally which matters, not the amount. Give what you can, a dime, a quarter, whatever is manageable for you. - This distress signal was first adopted by the German government in radio regulations effective April 1, 1905, and became the worldwide standard under the second International Radiotelegraphic Convention, which was signed on November 3, 1906, and became effective on July 1, 1908. - The first American citizens receive information over the new national income tax in 1913. A married man living with his wife, who is in receipt of an income of $5,000 pays $10 a year and if his income is $10,000 he pays $60 per year.